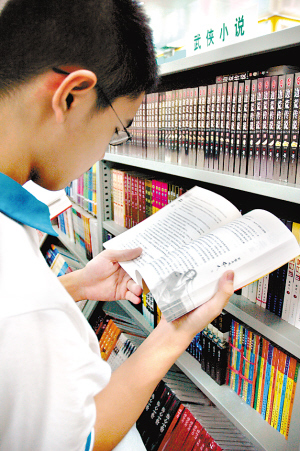 China's literary classics are losing out to popular culture as far as teenagers are concerned, according to a report of the Guangzhou Daily on August 21. Before the school summer vacation started this year, Ms Li drew up a "reading schedule of literary classics" for her daughter, a senior secondary school student. But by the end of the vacation, her daughter had only read ten pages of A Dream of Red Mansions, a novel published in the early Qing Dynasty (1644-1911) by Cao Xueqin, just one of the classics Ms Li had hoped her daughter would plow through. A hapless Ms Li lamented: "What's the matter with these middle school students now?" A teenager engrossed in the popular book Blue Stone. Xiao Kai, a senior secondary school boy who spent most of his vacation in remedial lessons, had plans to play basketball, surf the Internet and watch TV for the remainder of the holidays, His father, however, had different ideas. He'd hoped that the boy would catch up on his reading of the classics. There is no shortage of the classics in Xiao Kai's bedroom, including Chinese classics such as Heroes of the Marshes and The West Chamber, and western ones like Notre Dame de Paris, A Tale of Two Cities and The Old Man and the Sea. But the only one that Xiao Kai has read so far is The Old Man and the Sea. "I only read it because it was one of the shorter one," Xiao Kai admitted. "My son is only interested in 'rubbish'," Xiao Kai's father said. The "rubbish" he referred to include foreign cartoons, the Internet, illustrated martial arts comics and popular magazines, which are regarded to be "a great scourge" by parents and teachers. "My parents go on and on about how reading literary classics is useful to help me cope with examinations and education. That's what I hate most," Xiao Kai said. Many of the literary classics that parents push their children to read are used as textbooks in middle schools and their contents frequently appear in examination papers. This is why parents and teachers urge children to read the classics. "My teacher wanted very much for us to read A Dream of Red Mansions, but none of us did it," said Xiao Wei, another senior secondary school boy." So, before the final examination this year, my teacher used two lessons to give us a quick summary of the story, drawing pictures of the characters and the storyline so that it'd be easier for us to remember," Xiao Wei added. Xiao Wei was speaking with the newspaper in a Guangzhou Bookstore that has on sale simplified and abridged versions of many Chinese and Western classics. 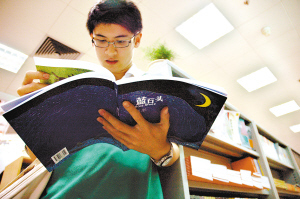 Yang Jinsong, a teacher from Guangzhou Zhixin Middle School, said that parents and teachers are keen for children to read the classics because they feel this will help in examinations. And it is precisely why the children aren't interested. Ah Min has just graduated from junior secondary school. It was her grandfather who encouraged her to read the classics when she was younger. But cartoons are now her favorite: "Ancient classics are boring and they depict a cruel reality that I don't like," she said. Ah Min's favorite cartoons include Detective Conan and Pirate Lu Fei. "They teach us to be courageous and friendly," she said. Like Ah Min, Zi Yin, a junior secondary middle school girl prefers Virtual City written by Guo Jingming to the classics: "I enjoy the novel very much, and the writer is so smart," she said. "Literary classics take place in time too far removed from us, their stories are too long and we have no time to read," according to many of the students interviewed by the newspaper. A teenager studies a martial arts book. In addition to comics and cartoons, the Internet is also proving to be a major challenger to traditional forms of entertainment for China's youth. Children spend a lot of time surfing the Internet for quick access to entertainment and pop culture, and many are aware that it is all part of the current "fast-food culture". "We love pop culture, even if they are artificial," they said. And they have no illusions about pop culture today becoming classics in the future. Chen Yijing, vice director of the Guangzhou-Hong Kong-Macao Juveniles Research Institute, said that what juveniles need today is something to satisfy their hunger for knowledge and entertainment, but most of what is available today is "lacking in nutrition", and they know this. "It indicates that today's youth is very much at a loss in terms of culture," Chen said. Chen added that the age gap between the children and their parents has plenty to do with the disinterest shown by the children. The children are searching for something that actually interests them; parents tend only to think about whether or not reading classics would be useful for exams. Parents also worry if the new sources of entertainment will have a bad impact on their offspring. Chen suggested that parents would be much better off trying to guide their children rather than criticize them for their choices. He also pointed out that whilst he believes it is worthwhile for children to read the classics, they don't necessarily have to do it anytime soon. "Reading is a lifelong hobby. People can choose to read the classics when they really want to." It would also seem that little is gained from forcing a child to read the classics. Many of the students interviewed said: "The more they drive us to read, the more we are unwilling to do it."